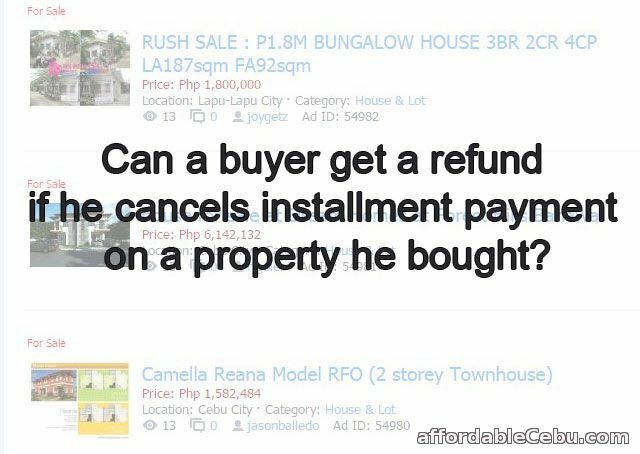 Can a buyer get a refund if he cancels installment payment on a property he bought? the developer fails to develop the subdivision or condominium project according to the approved plans and within the (promised) time limit? The answer is YES. There are two laws that entitle a buyer to a refund under the 2 varying scenarios above. Let us start with the first scenario. This law applies to residential properties including condos where the buyer has paid at least two years of monthly installment (including installment payment made on down payment or equity) and defaults on the succeeding payment/s. If the buyer decides to cancel the purchase, he is entitled to a 50% refund of the total installment payments made including down payment, deposits or options or reservation fee. If the buyer defaults and cancels after making three or four years of monthly installment payments, he is entitled to the same percentage of refund , 50%. However, if he defaults and cancels after making 5 years of installment payments, he is entitled to an additional 5% or 55% refund. The buyer is entitled to an additional 5% refund every year thereafter but the refund should not exceed 90% of total payments made. Thus, the buyer gets a 60% refund if he cancels after paying 6 years of monthly installments, 65% if after 7 years, 70% if after 8 years, 75% if after 9 years, 80% if after 10 years, 85% if after 11 years and 90% if after 12 years. He shall not get any additional refund if he cancels after the 13th year as 90% is the maximum allowable refund under the Maceda Law. So far, I have only answered the issue of refund relating to a buyer who lost the financial capability to make installment payments on the property he bought. We will now go into how a buyer can get a full refund in case the developer fails to deliver the property as promised. We shall look at the buyer’s right to a refund resulting from the developer’s failure to deliver a project according to the approved plans within the promised time of completion. March 2011, I bought a unit from Aurora Heights along Katipunan Ave., Quezon City, a project of First Homes, a subsidiary of Eton Properties. I am still paying for the down payment as they have an installment scheme for the 30% DP. They committed that turn over date would be end of 2013 and construction would start late 2011. It’s now more than a year and I have not seen any construction in the area. I live near the project site and pass by it everyday on my way to work that’s why I know that no construction is ongoing. I could not believe the blatant disregard of this developer for the investors as we were never notified what was causing the construction delay. That’s when I decided to call their Customer Service. Apparently, the community around the area is protesting the building of the condominium. We were not told when construction would commence as they were given a Temporary Restraining Order by the courts. I have asked if there are options to pull out my investments but they said that I cannot. It is stipulated in the contract. Is this lawful? Can we get our money back? Yes, you can get your money back as you are protected by PD (Presidential Decree) 957. Like the Maceda Law, PD 957 is an old law that was promulgated during the time of President Ferdinand Marcos. PD 957’s main objective is to protect real estate buyers from fraudulent and manipulative developers who aggravate the economic, social and moral condition of the Filipino people. Note: PD 957, as originally decreed, gave the National Housing Authority exclusive jurisdiction to regulate the real estate industry. Such jurisdiction was transferred to the Housing and Land Use Regulatory Board (HLURB) in 1986. PD 957 is rather long; I shall only delve on its salient points that are relevant to the issue at hand: Refund in case of the developer’s failure to deliver the project as promised. For our purpose, the most important provision of the law is found in Title IV, Section 23. Non-Forfeiture of Payment No installment payment made by a buyer in a subdivision or condominium project for the lot or unit he contracted to buy shall be forfeited in favor of the owner or developer when the buyer, after due notice to the owner or developer, desists from further payment due to the failure of the owner or developer to develop the subdivision or condominium project according to the approved plans and within the time limit for complying with the same. Such buyer may, at his option, be reimbursed the total amount paid including amortization interests but excluding delinquency interests, with interest thereon at the legal rate. How does PD 957 safeguard the welfare of home buyers? Every project, whether it’s a subdivision or a condominium, goes through a stringent series of applying for and seeking approval of several permits, clearances and certificates from a number of government agencies, primarily from HLURB. Among others, these are the Development Permit, Certificate of Registration and License to Sell. The developer’s compliance with the above requirements shall result to the issuance of the Certificate of Registration by the HLURB. Said certificate, however, does not authorize the developer to sell or pre-sell his project unless he shall first obtain a License to Sell from the same office. The License to Sell is issued upon determination that the developer is of good repute, that his business is financially stable and the proposed sale of lots or condominium units to the public will not be fraudulent. Note that the documents attached to the application for a Certificate of Registration; and the License to Sell are public documents that are open for inspection to anyone who might be interested in the project. The most important part of the License to Sell is the Program of Development which indicates the project’s time of completion. Whereas, for the Registration, the development plan is the most important. Deviations or failure to comply with these are the ones referred to in Title IV, Section 23 of PD 957. These are the promises or warranties made by the developer and failure to deliver them shall entitle the buyer to a full refund. Claims in the developer’s brochures, prospectus, printed matters, letters or in any form of advertisement also constitute a warranty. With high-rise condominiums and expansive subdivisions being the norm nowadays, the one year time of completion in the law has become unrealistic. Today, a high-rise condominium tower of, say, 35 to 40 storeys tall takes an average of 3 ½ to 4 years to complete. For most buyers, what‘s important is the immediate start of construction. Although the cause of delay of the construction of Aurora Heights Residences is the Temporary Restraining Order issued by the court resulting from the protestation of the people in its vicinity, the developer’s problem is not your problem. You bought a unit on the assumption that doing so would be problem-free. You were told that construction of the condominium would start late 2011 and turnover date would be end of 2013. Two years seems to be an unrealistic period to construct a high-rise building. Such promise was most likely made to you by the developer’s brokers or agents. As such, the developer is liable for any claims or assertions made by its sales people. Go back again to Title IV Section 23 of PD 957. Before desisting from further payment, you must first notify in writing the developer of your intention and invoke this provision of PD 957. In said notice, be clear that you are asking for a full refund plus interest on the total amortization you paid. File a letter of complaint at the HLURB and attach a copy of your letter to the developer as an annex. For good measure, copy furnish Housing Tsar VP Jejomar Binay, Chairman of the Housing and Urban Development Coordinating Council (HUDCC). On the assertion of the Customer Service staff that you cannot pull out you investment because it is stipulated in the contract, any stipulation in a contract that is contrary to law is null and void. "Can a buyer get a refund if he cancels installment payment on a property he bought?" was written by admin under the Real Estate category. It has been read 4649 times and generated 4 comments. The article was created on 18 January 2016 and updated on 18 January 2016. I need your advise. On July 2017 we paid the full amortization for a house and lot to Filinvest and they promised to us that the unit construction will start once the amortization will be fully paid. As per them the unit will be turnover on May 2018 however it has been delayed due to some technical issues. I signed a nonrefundable agreement however it doesn't make since that I am paying a rental apartment while waiting for the unit to be turnover on September this year. So I decided to cancel the unit purchased. Can I request for a full amount refund plus interest? Hi, I really needed a rush answer to my current situation. I am in abroad, I bought an land made payment for RF Mar 2016. The update on the land came almost a year before they advise me that I can start the down payment. So I made my first instalment dp of 30k Aug 2017. I decided to make a refund in Nov due to lack of communication of the owner to me. Now, am I entitled to refund 100% of the DP? The owner has not been responsive to my emails. Text they do but very rare to reply even with calls. How can I check their company is legal. Please please I really need your assistance. I would like to raise a concern relative to this issue. We purchased a house last May and we have completed the DP which was 260k this December. However, the contract that our developer made is not the terms we have verbally agreed from the time we have decided to buy the house. Our amortization will start this February 03 and the amount which was quoted to us is not actually the amount we quoted to us when we signed the Offer Purchase. Now me and my husband is having a second thought if we will continue to buy it or we will just cancel and ask for our refund. Is it still possible to have our DP refunded to us in a full amount? Can a condo buyer get a refund if he cancels the contract but has paid 30 months? Can I get back my money I sent to the Receiver which he didn't claim yet in Palawan Pawnshop? Can I Get Cedula (Community Tax Certificate or CTC) in Baranggay Office? Can I get back my money I sent to a Scammer thru Palawan Pawnshop? Can I use my father's surname on the ATM card instead of using my husband's surname?